There areserious challenges ahead in mitigating space clutter now orbiting the Earth,problems that are exacerbated by the rise of small satellite launchings as wellas using debris removal techniques that mimic anti-satellite systems. Expertsfocused on the escalating menaceof orbiting litter during ?Green Space: Addressing Space Debris - End ofLife Operations,? a recent session at the Space 2009 Conference and Expositionin Pasadena, Calif., staged by the American Institute of Aeronautics andAstronautics. Recentmaneuvers by both the space shuttle and the International Space Station to avoidspeeding space junk have helped flag the issue. So too has the February 11collision between Russia?s defunct Cosmos 2251 satellite and a U.S. commercialIridium spacecraft ? purportedly the first time two intact spacecraft haveaccidentally rammed into each other. Moreover,China?s anti-satellite test in January 2007 peppered low Earth orbit withthousands of fragments that continue to plague the safety of healthy spacecraftoperated by multiple nations. Over 20,000objects arebeing tracked at present, noted William Ailor, Principal Director of TheAerospace Corporation?s Center for Orbital Reentry and Debris Studies in ElSegundo, California. 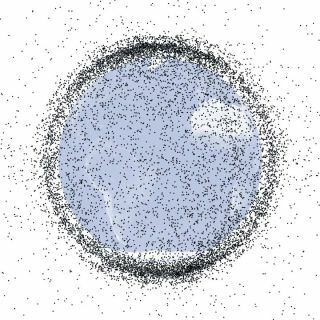 ?A large majority of those are in low Earth orbit,? hesaid, consisting of dead satellites, spent rocket bodies, as well as largedebris fragments from collisions and explosions. Ailor saidthat untracked objects ? greater than one centimeter in size ? are estimated torange between 200,000 and 600,000 bits of flotsam, such as slag from solidrocket motors, liquid metal droplets from nuclear reactors, as well as itemslike lens covers that are shed during operations. Theseobjects, most of which flitter through low Earth orbit, are of a size thatcould takeout a satellite, Ailor added, or could reduce the performance of orbitingassets. Onenewcomer to the dilemma is the proliferation of tiny satellites, dubbedcubesats, ?making the orbital debris environment worse,? said John Lyver,Manager of the NASA Orbital Debris Program, Office of Safety and MissionAssurance at NASA Headquarters in Washington, D.C.
?Theselittle satellites, while they are neat, while they are cheap, while they dogreat stuff?yes, they are increasing orbital debris and its uncontrolledorbital debris,? Lyver pointed out. Activediscussion is underway as to when the point will be reached when there are somany collisions between space junk that it grows exponentially. ?Thatdebate is going on right now,? said chair of the session, Joseph Rouge,Director of the Pentagon?s National Security Space Office, Washington, D.C.
?Some in myoffice say that crossing point was 10 years ago?others say it?s 20 years away,?Rouge said. ?I think the real key is we need to do something about it or we?regoing to be in trouble.? Collisionalcascading will start in low Earth orbit within a few decades, explained HeinerKlinkrad, head of the European Space Agency/European Space Operations Center?sSpace Debris Office in Darmstadt, Germany. ?When we dolong-term projections of the space debrisenvironment, it turns out that space debris mitigation measures will delay,but not prevent, collisional cascading from happening in the low Earth orbitregime,? Klinkrad advised. ?This is even so if we stop all launching activitiesright now,? he added, and ?once that [cascading] process has started there isno way of controlling it again.? Klinkradsaid that the application of mitigation measures is a necessary butinsufficient step to control the space debris environment. Additionally, spacedebris remediation will be a technically demanding and expensive undertaking,he said, but such costs must be viewed in relation to the value of spaceassets. ?Debrisremoval is part of a whole suite of solutions,? said Wade Pulliam, ProgramManager for the Defense Advanced Research Projects Agency (DARPA) in Arlington,Virginia. That solution set, he said, includes satellite situational awareness,avoidance maneuvers, as well as removal of end-of-life satellites. ?I think[debris] removal is important and critical in the future?and it?s also atechnically difficult problem,? Pulliam said. There are different solutions fordifferent regimes at different particle sizes, he explained, so grappling withsmall particles in low Earth orbit in not the same as dealing with largederelict satellites in geosynchronous orbit. ?Space isgetting crowded,? especially in the geosynchronous satellite belt, said JosephChan, Senior Manager, Flight Dynamics for Intelsat in Washington, D.C. There?sdefinite need for better communication between satellite operators, he said,and for all to make use of common formats and protocols to better compute closeapproaches between spacecraft. At themoment, ?our most comprehensive source? for knowing the whereabouts of spaceobjects, Chan said, is a computer-generated two-line element set of orbitalinformation such as those provided by the U.S. North American Aerospace Defense Command andused by NASA. But there are ?large uncertainties? in this kind of data, andthere?s need to improve the way to detect close-approaches and monitorconjunctions of objects, he said. ?We don?thave a warp drive likeon Star Trek,? Chan advised. ?We would like to detect close approaches afew days in advance.? DARPA?sPulliam said that international participation is extremely important in debrisremoval. But first and foremost, ?we need to find innovative solutions that areas inexpensive as possible,? he said. ?In theend?I think economics are going to drive us,? Pulliam said. Over theyears, various orbital debris removal ideas have been championed: fromdebris-blasting laser systems, use of large junk-snagging foam spheres or nets,even space tugs. Pulliam said that DARPA is engagedin assessing the orbital debris dilemma, eying a range of prospective ideas todeal with the issue. ?DARPA has initiated a study toexamine the problem, survey possible solutions, and determine if emergingtechnologies and concepts can be combined to provide an economical solution tothis problem,? Pulliam told SPACE.com. To this end, DARPA and NASA areco-hosting an international conference on orbital debris removal in theWashington, D.C. area December 8-10, Pulliam explained. ?This first of its kind conferenceis solely dedicated to addressing the issues and challenges involved withremoving manmade orbital debris from Earth orbit,? Pulliam said. Ailor of The Aerospace Corporationsaid there?s potential for a commercial debris removal service. There might bea business case for an enterprising firm to make money on satelliterepositioning or removing debris, he said. However, Rouge of the NationalSecurity Space Office underscored the thorny issue of differentiating between aspace debris removal system and an anti-satellite capability. ?The idea that a debris removalsystem is operated by one country?goes up and removes something that is ownedby another?that?s going to be a touchy issue,? Ailor said. ESA?s Klinkrad concluded: ?I guessthe debris removal system has the potential to be an anti-satellite if youdon?t ask the owner if he wants the spacecraft to be removed. ?